Recently, we published an article overviewing the kitchen triangle and how it can make kitchen life easier. As a refresher, the kitchen triangle is comprised of the sink, the range and the refrigerator. Basically, the concept says that these three stations should be laid out in a triangle (go figure), relatively close together (no less than 4 feet and no more than 9 feet apart generally speaking). This layout should help you save time when doing your regular kitchen duties. That’s all fine and dandy, but what if your sink, stove and fridge aren’t in a triangle; or you’re not quite sure how to set up this type of layout in your kitchen? We found this article helpful when trying to figure out how to implement the kitchen triangle into your design: How to Set Up a Kitchen Work Triangle. Make sure as you plan, to keep in mind what you do and how you move through your kitchen. Don’t worry so much about exact distances, but rather keep your design flowing and give yourself proper space for prepping and other activities. 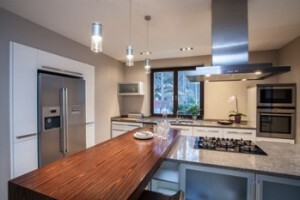 Many homeowners even opt for having different “zones” in their kitchen. Although this differs from the triangle, zoning uses a similar concept, keeping flow and efficiency the priority. Let us know how you made your kitchen more efficient in the comments below.